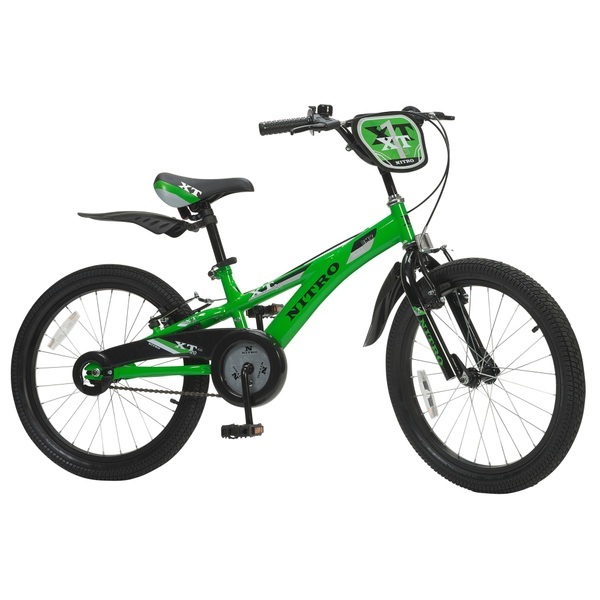 Be the coolest kid on the block with the 20 Inch Nitro Green Bike. This sleek BMX style bike features a safety stem and a cool BMX-style handlebar. The textured handlebar grips provide the cyclist with a firmer and more comfortable grip, allowing them a safer and easier ride. The 20 Inch Nitro Green Bike has a green frame of strong, durable steel, with sporty Nitro graphics. These graphics are continued on the racing-style front plaque and the comfortable black saddle, giving this slick bike an edgy green and black theme. The 20 Inch Nitro Green Bike is equipped with front and rear steel V- brakes, featuring a direct-pull mechanism for instant braking. Front and rear reflectors help you to stay seen while out and about on this bike. The fully enclosed pistol type chain guard helps to protect the rider’s fingers and adds to the bike’s streamlined design. The plastic half mudguards protect clothes from splashes while cycling, and are ingeniously tapered to give the design of the 20nch Nitro Green Bike a dramatic finish. This bike features alloy rims with air pumped tyres, giving you a smooth ride. EU Warning: Not suitable for children under 8 years old. To be used under the direct supervision of an adult. Helmet and safety gear recommended.